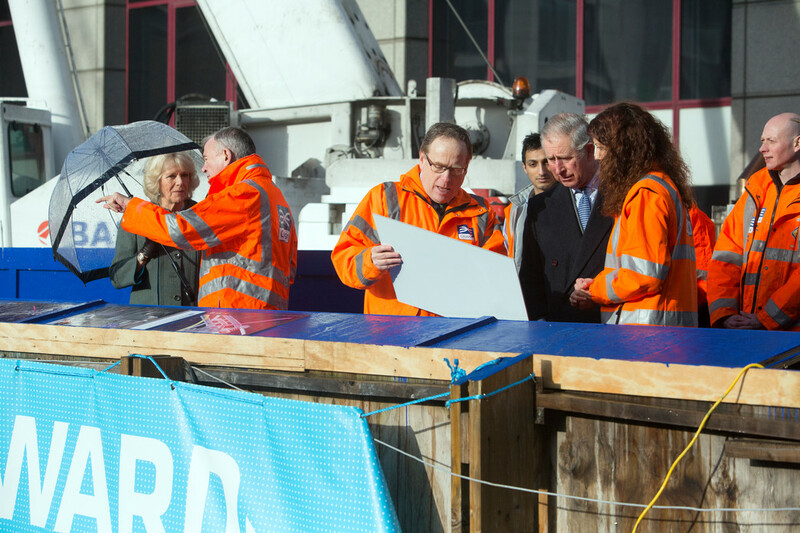 Crossrail workers meet Prince of Wales and Duchess of Cornwall at new Farringdon Crossrail station - Crossrail . For information about the Elizabeth line please visit the Transport for London website. 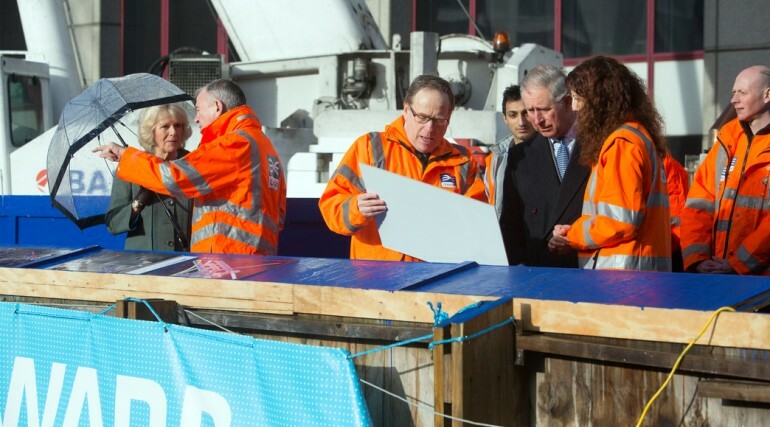 Two apprentices and a graduate engineer working on the Crossrail project met the Prince of Wales and Duchess of Cornwall during a visit to the new Crossrail station under construction at Farringdon. Apprentices Jack Burke, 20, from Bermondsey and Bob Gridley, 34, from Walthamstow, together with graduate engineer Akif Mahboob, 23, from Gants Hill in Ilford were part of a select group of workers at the station chosen to meet their Royal Highnesses on a special tour to mark the 150th anniversary of London Underground. 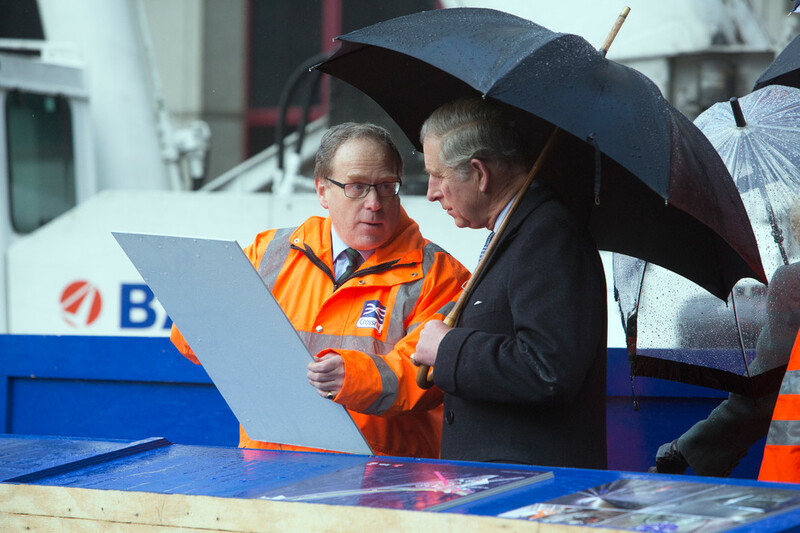 While marking the anniversary, their Royal Highnesses gained an insight into the future of London’s transport via the Crossrail project which is delivering the biggest transformation to London’s transport in more than 50 years. Jack Burke and Bob Gridley are among 130 apprentices working across 40 construction sites to build the Crossrail route. More than 400 apprenticeships will be offered during the construction of Europe’s largest infrastructure project. Jack and Bob are both undertaking an 18 month Spray Concrete Lining apprenticeship with Crossrail contractor BAM Nuttall and are among the first apprentices to train at the Tunnelling and Underground Construction Academy (TUCA) set up by Crossrail in east London to help address a skills shortage in the construction industry. Bob secured his apprenticeship after Jobcentre referred him to pre-employment training at the Tunnelling Academy. Jack and Bob are now part of the team working 25 metres underground to construct the platform tunnels, each the length of two football pitches, that will be at the heart of the new Crossrail station at Farringdon. Akif Mahboob joined the Crossrail project in October 2012 having completed a Masters in Civil Engineering at University College London. Akif’s talents were spotted by contractor Laing O’Rourke who signed him up as a Graduate Engineer where he is currently working on the construction of the new Crossrail station at Farringdon. He is part of the engineering team managing the excavation and foundation works to create a 25 metre deep shaft that will house the western ticket hall for the new station at Farringdon. Akif grew up close to Tube stations and as a child he often considered how his local station and the Underground had been engineered. His curiosity spurred a passion that eventually turned into a career. When Crossrail opens in 2018, it will increase London's rail-based transport network capacity by 10 per cent and dramatically cut journey times across the city. 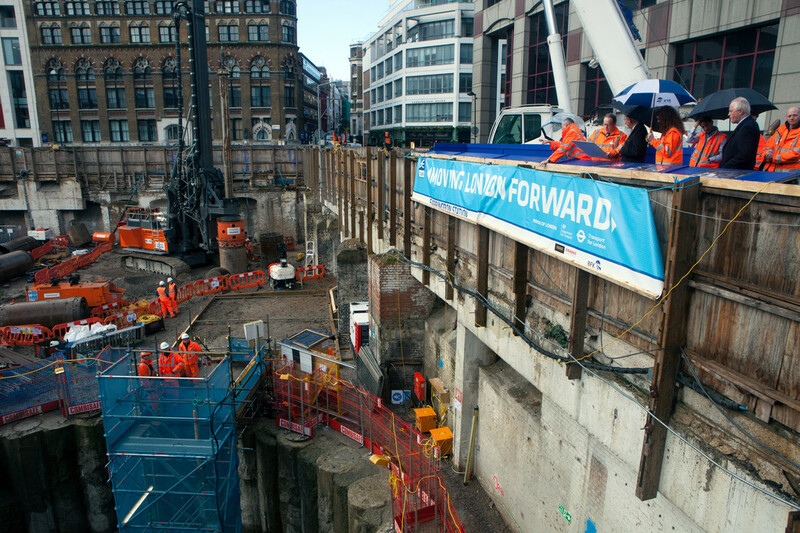 As Europe’s biggest construction project, Crossrail is creating thousands of jobs and training opportunities. 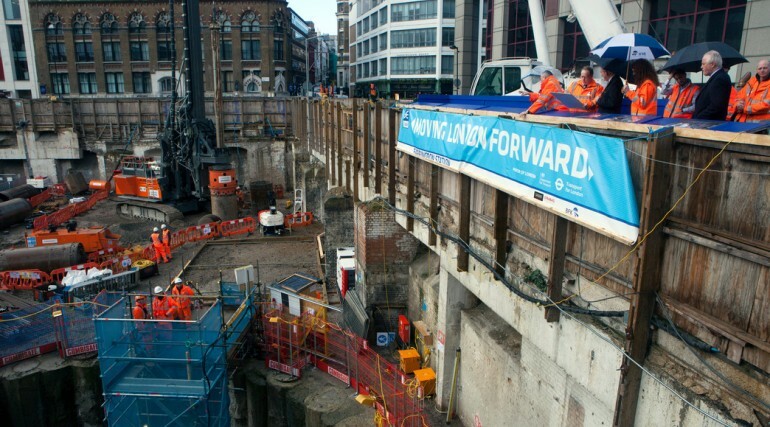 There are currently 350 people working at the two Crossrail Farringdon sites, building two new ticket halls, passenger tunnels and platforms and preparation for the first tunnelling machine to complete the first section of Crossrail’s tunnel route in late 2013. When Crossrail opens in 2018, Farringdon will be one of the busiest rail stations in Britain and will be the very heart of London’s rail network linking transport services north, south, east and west. Crossrail workers meet Prince of Wales and Duchess of Cornwall during visit to new Farringdon Crossrail station worksite. Their Royal Highnesses met Crossrail Chairman, Terry Morgan (second left) and Chief Executive Andrew Wolstenholme (middle) who provided an insight into the future of London’s transport via the Crossrail project which is delivering the biggest transformation to London’s transport in more than 50 years. 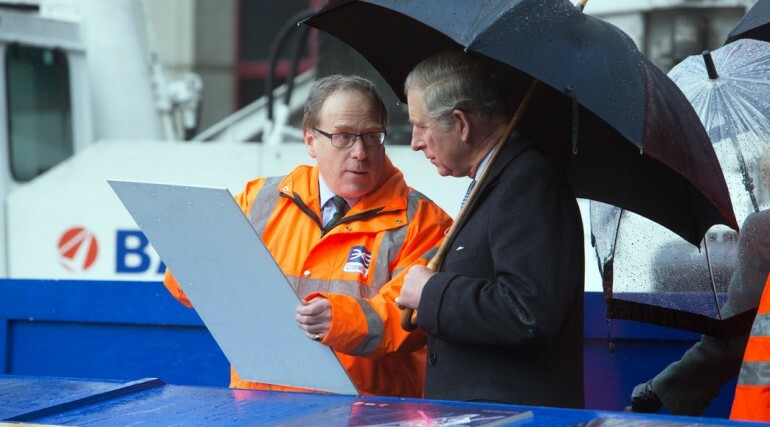 Crossrail Chief Executive Andrew Wolstenholme with HRH Prince of Wales.